After a journey of more than ten years, Rosetta is finally at comet 67P/Churyumov-Gerasimenko. Since its launch in 2004, ESA’s comet-chaser has traveled an incredible 6.4 billion kilometers, passing by Earth twice and Mars once, observing asteroids Šteins and Lutetia up close and spending almost three years in deep space hibernation to conserve power before waking up in January 2014. Today, on August 6th, Rosetta caught up with its comet, currently tumbling through space at 55,000 km/h. 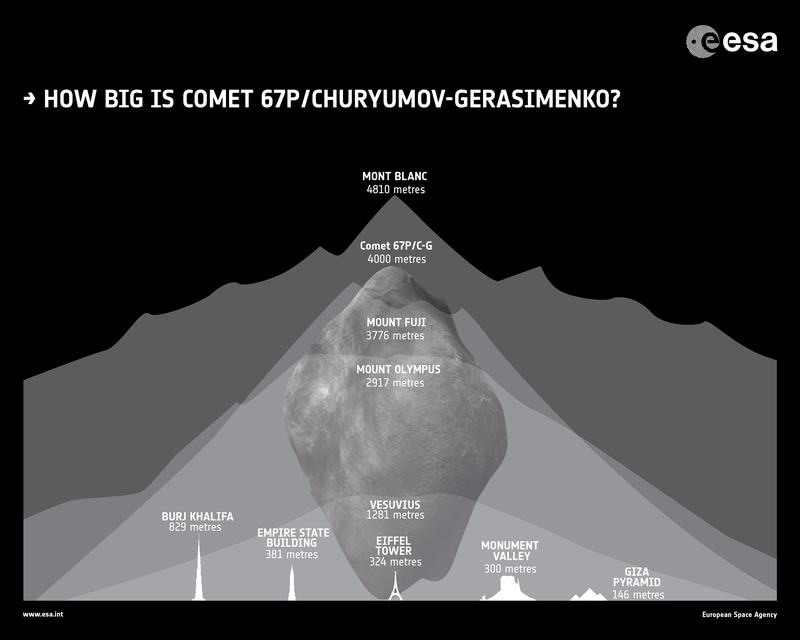 67P/Churyumov-Gerasimenko is a periodic comet - that is, it returns to the inner solar system relatively frequently (67P orbits the Sun once every 6.5 years). The ‘P’ in the name stands for periodic; Klim Churyumov and Svetlana Gerasimenko were the two astronomers from Kiev who discovered the comet, the 67th to be identified as periodic. Comets are still mysterious to us in many ways. They travel closer to and further from the Sun than most other objects, and are some of the oldest bodies in the solar system - in them, we can read the origins of the worlds in our neighborhood. As the Sun warms the ices of 67P/Churyumov-Gerasimenko, its coma - the envelope of vapor and dust surrounding the nucleus - will begin to brighten, and escaping tails of dust, gas and ions will curve away from the Sun; these tails can sometimes be millions of kilometers long. Comets also have a tendency to oblige us with stranger sorts of activity, such as by sprouting jets. Rosetta and Philae have a comprehensive set of instrumentation between them: spectrometers to measure the composition and abundance of different compounds, multiple instruments to study the dust spewed from the surface, a temperature-mapping instrument, high-resolution cameras, a probe and radar to investigate the sub-surface and a host of other tools - almost everything a scientist could wish for. The first detailed images have been coming in, and they show an odd and rather spectacularly choppy body, the size of a large and irregular mountain, with cliffs, spires, bright, smooth patches and deep shadows. Glimpses that launch a thousand questions; and as Rosetta, Philae, and the science teams on Earth get down to work, the journey is really only just beginning.